Posted on Tuesday, January 3, 2017 by Lissa M.
The NH Humane Society is pleased to be the recipient of the proceeds raised by a bake sale conducted by Mrs. Black’s second graders at Woodland Heights Elementary School. Students and their families’ baked for the sale, held on Tuesday, December 20, 2016 at the school. The second graders then used their math skills to tally the proceeds – a whopping $207.00! NHHS Development Director, Lissa Mascio, visited the second graders on Thursday, December 22, 2016 to collect the donation, along with some homemade cat toys, and talk to the students about the shelter and animals that live there while waiting for their forever homes. 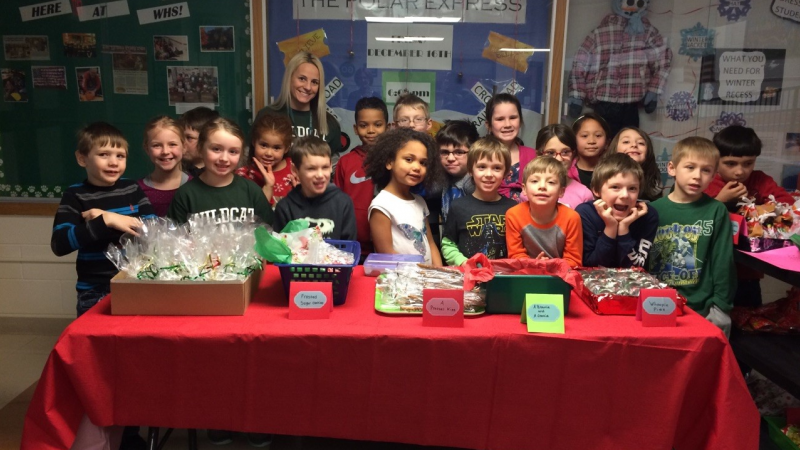 Mrs. Ashley Black runs the bake sale each year with her second grade class to raise money for the NH Humane Society. This year the turnout of baked goods was so phenomenal the students were able to donate the remainder of the goodies to the Carey House – two good deeds accomplished with a single event. The NH Humane Society is a 501(c)3 non-profit whose mission is to find responsible and caring forever homes; provide shelter for the lost, abandoned and unwanted animals; advocate and be the voice for the voiceless. The Society works hard to prevent cruelty to animals and offers education and outreach programs, pet therapy, and many community initiatives to help people and their pets. Community fundraising efforts, such as the money raised by the Woodland Heights Elementary second graders, are an integral part of keeping the shelter open and providing valuable services to the 17 communities in the NHHS area, and beyond.